Megan Golden is a seasoned marketer with ten plus years shaping brands, telling stories and building teams in the Silicon Valley. 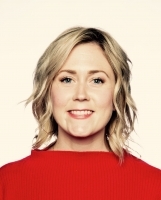 Today Megan leads global content marketing for LinkedIn Sales and Marketing solutions, driving narratives, building content franchises, and leading a small army of wicked-smart content creators. Many moons ago, she began her career at Salesforce partnering with the CMO on the go-to-market strategies for new vertical solutions. Later she joined that same executive at Zuora as employee 11. Megan spent more than 7 years building the marketing organization from the ground up mastering every marketing function. The last half of her tenure at Zuora she was responsible for global PR and building a well oiled content marketing machine from scratch. When Megan’s offline you can find her running through the San Francisco Presidio, grabbing wine with her squad or hitting the beach with pup Riggins.